shmups.system11.org • View topic - Article: Thoughts on Indie Shmups Providing Scoring Info. Article: Thoughts on Indie Shmups Providing Scoring Info. Post subject: Article: Thoughts on Indie Shmups Providing Scoring Info. Recently, I have been playing a number of indie shmups for score and have had some thoughts on how it would be beneficial it would be if more of them provided more general information on how the scoring systems work. So I've written an article that I think could ... possibly ... lead to some constructive conversation. I'd say it's worthwhile to read the article to the end, as I get to my reasoning and overall thoughts at the end of it. I've never found much fun in "exploring" and "discovering" how a scoring system works, so I'm all for releasing details about them. In fact I think if a scoring system is too cryptic it'll just turn people away rather than encourage them to dig deeper (you won't look for that which you don't know exists...). I've done some digging for games, ring^-27 to take an example, but that was thanks to there being a comprehensive practice mode allowing me to test many different things, and I would rather have not gone through that to figure out a system that it turns out isn't all that complicated. The ideal to me is when a scoring system is simple, and more importantly, discoverable enough that a separate guide is unnecessary. For sure! I agree completely. An in-game solution is an awesome way to go about making things more clear. The manual/guide idea is more of like backup plan, for either already released games or for devs who feel an in-game solution would be difficult for one reason or another. I also agree that scoring system(s) should be explained from the get go; at least enough of it to get the player on the right track, if it happens to be a particularly complex one. This is one of the things I've always liked about the Touhou games -- everything about the scoring system (among other things) is explained in the manual. Perhaps not ideal, since it's never explained in-game, but the information is there for those who care about it. I think a few years ago someone on here started a thread to make a basic rundown of scoring systems in cave games, I remember DFK BL was one. For me I'd rather know everything at the outset then the game can be about mastering the technique rather than trying to figure out what's going on. So yes, I agree. Shoot the Bullet explains a lot about the mechanics in-game, including techniques and mechanics that most people never learn about despite finishing the whole game. In my opinion the way StB does it is the ideal way. Have an in-game manual that explains all the basics as well as some advanced things. In other words give the players the puzzle pieces they need to solve the puzzle. Oh yeah, I totally forgot most modern Touhou's have in-game help; I was thinking of the older ones, even back to the PC-98. Always liked reading through the manual/readme and the omake files. That's a really cool way of going about things. Yes stuff like that is definitely a good idea as well in case players don't keep track of the separate manuals or don't bother to look through them for one reason or another. 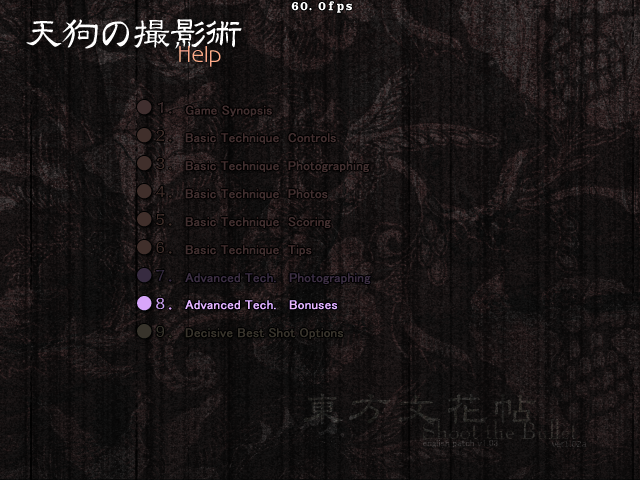 I'll keep my eye out for this when I start playing for score in Touhou games in the future. I don't really think these games should spell out everything. If it's all laid bare, doesn't it kill the fun of discovery? I kinda like it when something is discovered years after the fact as well, opening a game up further and fighting off boredom for everyone who's played it to death. I think they could somewhat replicate the Gamest/Arcadia approach of the old days with social media. I imagine back in the old days, a lot of the info in the mags came from the developer themselves, but in the guise of 'leaks' or 'community finds'. I remember in the days of Mortal Kombat, all those codes you could enter on the character select screen etc - Surely players didn't figure them all out on quarters! With social media they can keep the interest in a game by drip feeding new info to the player base. And then the players can collate it all on a wiki or guide or something, so it's kind of getting everyone involved? Having said all that, I'm a huge fan of game manuals and would love them to make a return. Manuals really didn't go into too much detail about scoring (that i know of), but what i liked about them was, they set a scene, you could admire the artwork - drawings and sprite work sometimes, and having a clear, marquee-like outline of the base game mechanics, weapons, stages and things. Not stuff you often need once you get familiar with a game, but they leave nice memories of when you were first discovering things. For me, they're kind of a game's personality and without them some games just feel soulless! If you want to "discover" things for yourself, you could always just not read all the information about it. Same holds true for existing games that didn't come with all their information but which people have documented extensively online. Besides, laying out all the mechanics doesn't necessarily mean that new discoveries won't happen. For instance, people are still discovering new tricks for Doom despite the source code having been available for 20+ years and the game's popularity for speedrunning. You'd think that with the source code there wouldn't be any secrets the game could possibly hide, but here we are. Well, i take your point on new tricks/Doom. I guess it depends on how potentially deep the game goes. Some aspects could be made public while still leaving a large amount to find. But when i talked about discovery, i meant in terms of everyone working towards discovering stuff being fun, not necessarily one player playing the game under a rock . But when i play something old for the first time, I still give it a good amount of time before "spoiling" everything for myself.